Trenton was settled in 1713-14, became the county seat of Jones County in 1779, and incorporated in 1874. Many of the original historical buildings in the town of Trenton were ravaged by fire, including the original courthouse (1764), the second courthouse (1937), and the entire southern business block (1941). The fire of 1941 brought fire engines from Kinston and New Bern to save the remaining buildings. 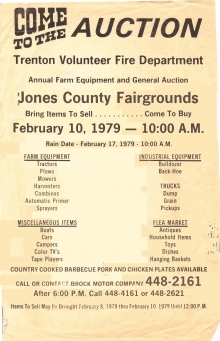 Action was taken in 1955 by several members of the community towards fire protection, and Trenton Volunteer Fire Department was born. Today, Trenton Volunteer Fire Department protects 250+ residents in the town of Trenton and covers approximately 78 rural square miles to protect 3000+ residents in a six mile radius. Trenton Volunteer Fire Department maintains and keeps in service numerous fire trucks, including two engine/pumper trucks, one tanker, one brush truck, and one equipment truck. Trenton Volunteer Fire Department currently has 28 members: 5 elected officials, 5 board members, and several junior fire fighters. Each year, TVFD responds to approximately 80 calls including structure fires, vehicle accidents, woods fire, etc. July 25, 1955 - The 1955 TVFD Constitution and 1955 TVFD By-Laws were written. Both were adopted by the members on August 8, 1955. The By-laws were revised in March of 2001. February 14, 1956 - Foundation was poured for the new fire house and town hall. TVFD still uses this same building today. The town hall has since moved to another location. Before this house was built, TVFD used an exterior area and covered the fire truck with a tarp. October 21, 1957 - A truck was bought from Aggie Haddock and a 1500 gallon tank was purchased from the Maysville school to create a water wagon for the Departments use. November 17, 1958 - Fire alarm air horn was installed at the TVFD fire station. That alarm was in use until the early 80's as telephones and pagers were used to alert firemen of the incident. The air horn was taken down in 2003. April 20, 1959 - Pole was erected for drying hose. This pole is still in service today. September, 1959 - Trenton Volunteer Rescue squad formed. September 19, 1961 - Alto Smith was elected to keep night watch at the fire house. Mr. Smith watched the fire house for nearly 25 years. January 15, 1962 - A water tank was erected in the town of Trenton to supply the fire department with water for emergencies. September 18, 1962 - Ambulance was purchased. 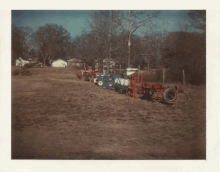 January 20, 1964 - A truck is purchased from the surplus depot in Raleigh, and C.W. Williams Co. installed a front mount pump and water tank for TVFD use. 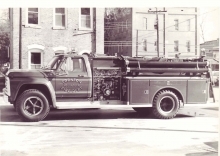 June 25, 1972 - Fire truck was purchased. April 2, 1973 - Phone system was installed by TVFD to alert more fireman to incidents. March, 2001 - The 2001 TVFD By-Laws were created and adopted.